With a fabulous flavor and texture, it’s no wonder Mussels are often called ‘Fruits of the Sea’. 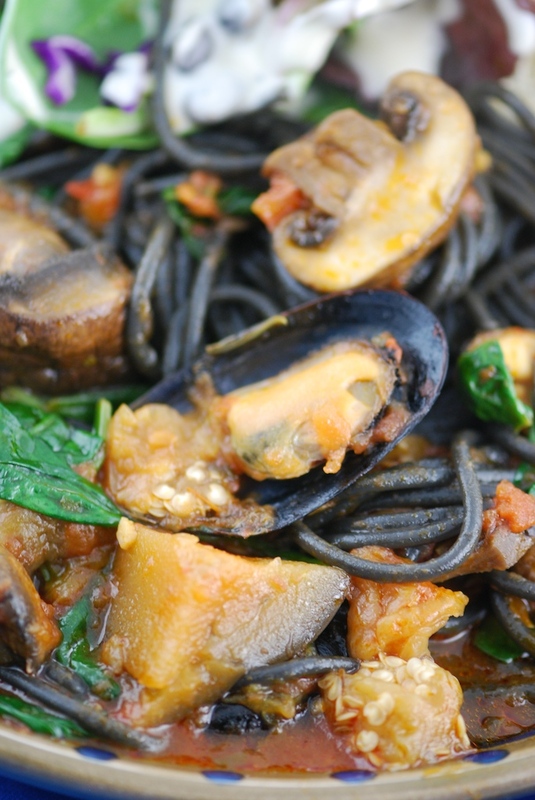 This simple recipe pairs clams with eggplant, mussels, spinach and tomato sauce with squid ink pasta for a tasty dish that’s easy to make. Cut eggplant into 1 inch cubes, sprinkle on all sides with fine sea salt and set in a colander to weep – after 30 minutes or so, dab and wipe dry and remove salt with kitchen towels (this removes excess water and astringency). Meanwhile, prepare live mussels by soaking for 5-10 minutes in several changes of salt water (1 TBS to 1 quart) – scrub as needed. Or thaw PanaPesca mussels and remove/discard the empty shell half. Meanwhile, spinach in boiling water and cook for one minute – remove to a colander and rinse with cold water. Squeeze well to dry and remove as much water as possible, and then chop lightly (chopping not necessary with baby spinach). Begin boiling pasta to al dente according to package directions, when done, drain well in a colander. In a large pan, sauté mushrooms for several minutes until beginning to soften. Add eggplant and saute for several minutes. Add Tony’s Marinara or Vodka sauce and bring to a simmer. 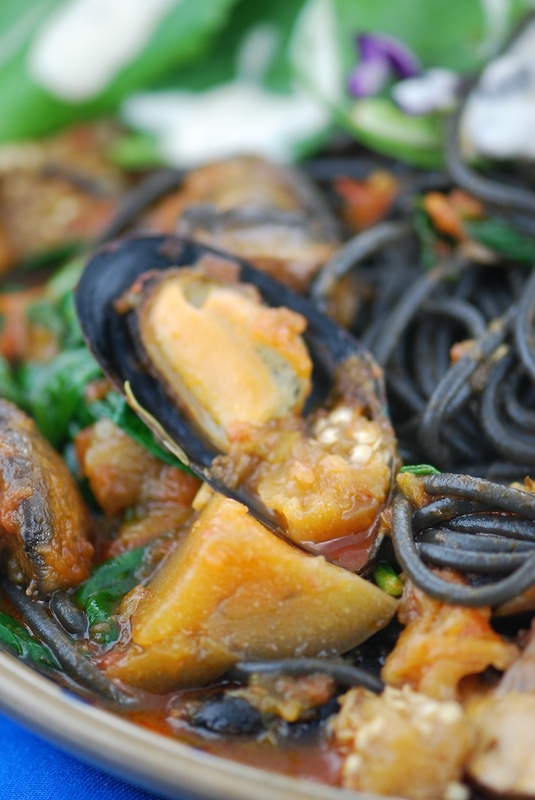 Stir in pasta and fresh mussels and continue to simmer for 2-3 minutes until mussels begin to open. Add spinach and simmer to marry and heat through (if using frozen mussels, add with the spinach). Serve with a tossed green salad and Tony’s Garlic or regular Ciabatta bread, toasted if desired. Serves 3-4.